Too often people imagine that long hours of studying are the best path to being a model, straight-A student. Yet research shows that highly successful students actually spend less time studying than their peers do—they just study more effectively. Teachers can help all students learn to more effectively use the time they spend studying by sharing research-proven techniques. In this era of social media and digital distractions, many students—and adults—do a lot of multitasking. But there is no such thing as successful multitasking, because much of the time spent is wasted on context switching, where the brain has to restart and refocus. Consider the formula “work accomplished = intensity of focus X time spent.” A student who is studying for AP Biology but also checks his texts and scrolls through Instagram has a low intensity of focus—say a 3. Though he spends 3 hours “studying,” his work accomplished is only a 9. On the other hand, a student who takes steps to focus solely on AP Biology has a high-intensity of focus—a 10. 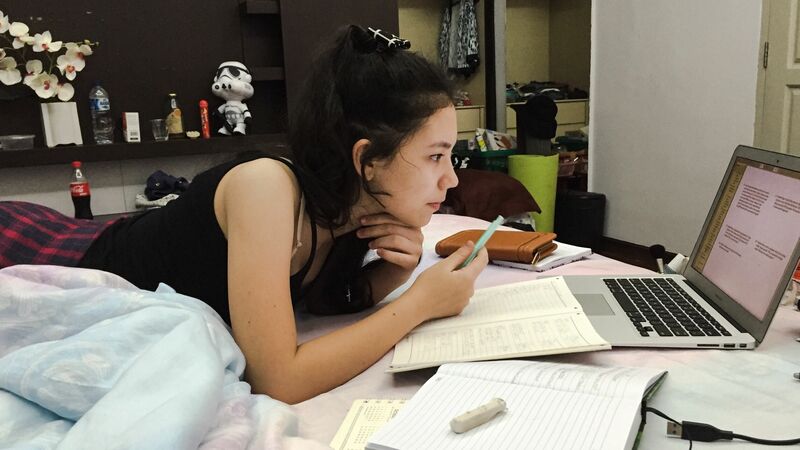 Though she spends only an hour studying, she accomplishes more than her distracted classmate did in 3 hours. Highly successful students have generally learned to avoid multitasking. Instead of spending a lot of time doing low-intensity work with numerous distractions, these students work for shorter periods at higher intensity, without any distractions from email, social media, etc. Their studying is more effective and leads to greater achievement gains. Many students use learning techniques that are time consuming and give the illusion of mastery. They become familiar with ideas and information in preparation for a test, but forget it a week later because their learning techniques never led to long-term learning. Researchers have found that the following techniques increase sustainable learning and retention when incorporated in students’ daily study habits. These techniques are difficult and require effort, and they slow down learning. Initially the learning gains seem to be smaller than with some ineffective practices. However, these techniques lead to long-term mastery. The book Make It Stick identifies several research-proven studying techniques. 1. Pre-test: When students practice answering questions, even incorrectly, before learning the content, their future learning is enhanced. Research has shown that pre-testing improves post-test results more than spending the same amount of time studying. 2. Spaced practice: Spacing out study sessions—focusing on a topic for a short period on different days—has been shown to improve retention and recall more than massed practice. The book How We Learn explains that spaced practice can feel difficult due to an initial forgetting of knowledge—reacquiring that knowledge takes effort. Creating flash cards that can be used for spaced practice and self-quizzing is effective. Students should create different piles when reviewing the flash cards. The cards they’re able to answer immediately should be placed in a pile to review three days later; those answered with some difficulty should be reviewed two days later; and those that they answered incorrectly should be reviewed the next day. 3. Self-quizzing: Testing has a negative connotation in this era of standardized testing, but it is a form of active retrieval practice. Encourage students to make test questions for themselves as they learn a new concept, thinking about the types of questions you might ask on a quiz or test. They should incorporate these quizzes into their study sessions, answering every question, even those they believe they know well. 4. Interleaving practice: Students may rely on blocked practice, studying a set of problems—such as multiplication problems—as a group until they feel mastery. A more effective method of studying is to work on a set of problems that are related but not all of the same kind—for example, a set of math word problems that call for addition, subtraction, multiplication, or division. The consecutive problems cannot be solved with the same strategy. This is more effective than doing one multiplication problem after another. 5. Paraphrasing and reflecting: Many of us have read a few paragraphs in a textbook only to realize that we didn’t retain a single concept or key point presented in those paragraphs. To show your students how to combat this, have them utilize intentional learning strategies. These include relating what is being learned to prior knowledge, thinking about how they would explain the content to a 5-year-old, and reflecting on and asking questions about the content.